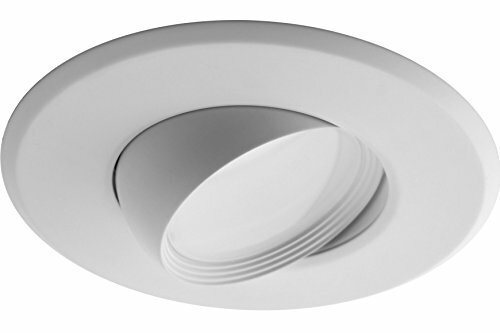 The NICOR Lighting 5/6-Inch Dimmable 2700K Adjustable Eyeball LED Recessed Retrofit Downlight, White (DEB56-20-120-2K-WH) is perfect for wall lighting and sloped ceilings. With a color temperature of 2700K, this light gives off the perfect amount of light for every room. The DEB56 provides the flexibility for those applications where the standard DLR56 doesn't quite fit. With 360 degrees of rotation and 35 degrees of adjustable tilt in both directions, the DEB56 gives you the ability to aim over 900-Lumens exactly where it's needed. The high performance DEB 56 is available in 2700K, 3000K or 4000K color temperatures. At NICOR, we’re always looking for ways to make your light better. We continue to innovate, challenge our thinking and improve our processes. We look to earn your business by delivering progressive lighting solutions designed to balance value with the highest design performance possible. We’re determined to bring you reliable products that provide real solutions. When you choose a NICOR product, you can rest assured you’re getting a product that has been tested to the highest standards available. Our commitment is to be a leader of reliability, innovation, and excellence because we understand just how important you are. Fully adjustable rotation and 30° tilt.